Textile Printing for Companies, Clubs, etc. Shopping Cart | Terms and Conditions | Imprint | What are Cookies? 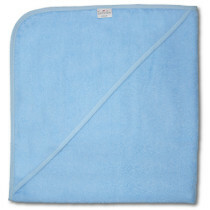 Here you can compose your personalized hooded towel. 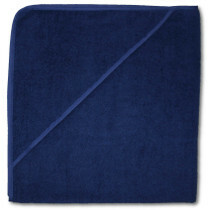 Our hooded towels have a size of around 80 x 80 cm. 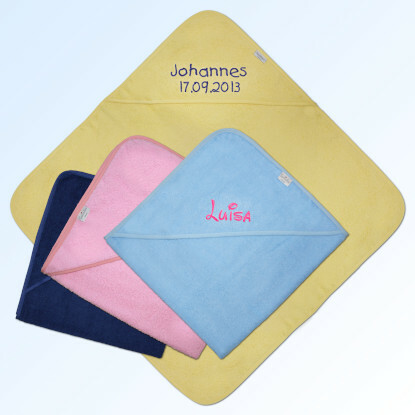 The textil will be embroidered with the text of your choice. The textile consists of 100 % cotton. 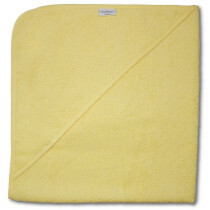 Please check the information about our baby textiles for more details about the hooded towels for babies. Now you can choose the textile color. Click on the round option field below the color for this purpose. Please note that the displayed colors are effected by your screen adjustments and might differ slightly from the original coloring of the textile and font colors. The font for the name of your child can be chosen here. Now you can choose the font color for the name of your child. 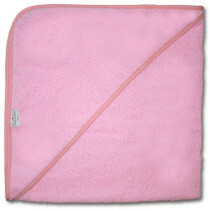 Please enter the baby name or text, that is to be embroidered to the hooded towel. Only one line of text is required the second line is optional.